In the beginning, cat feline distemper symptoms can mimic other illnesses and may be hard to diagnose without a veterinarian's expertise. Distemper in cats is also known as Feline Panleukopenia, and it can be a serious threat to the life of your cat. There is no cure for feline distemper. However, with early intervention and a good care plan, your cat can survive this disease. Panleukopenia, says veterinarian Dr. Jeff Werber, "is caused by the Feline Parvovirus. The virus damages the cells that line the intestines and also attacks the cat's lymph nodes and bone marrow causing a decrease in both the cat's white blood cells (affecting their ability to fight infection) and red cells (causing anemia and weakness.)" The effects of the virus on the cat's body will be noticeable with early-stage symptoms. It is always best to diagnose any illness in its earliest stages. When treatment is begun early in the progression of the illness, your pet's immune system can be supported in many ways. This will help her immune system fight the disease while she is still strong. That is why it is important to observe your cat carefully for the first signs of distemper in your cat and behavioral changes. A cat with distemper will develop a high fever. This would be 104 degrees or higher. An infected cat is likely to stop taking both food and water. The cat may take on a depressed appearance, moving little and sitting hunched over as if in pain. The animal may be much quieter than usual or she may "talk" more than usual. Dr. Werber describes the first set of distemper symptoms as, "what we call ADR, "ain't doing right." Along with the common symptoms listed above, "we can also see upper respiratory infection because of a lack of ability to fight disease. Kittens are more severely affected." As the hours go by, your pet will begin to develop more cat distemper symptoms. Once your pet shows the initial signs of distemper in cats, the rest of the symptoms can show up rapidly. In fact, the disease can run its entire course in fewer than five days. 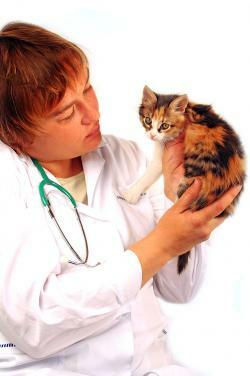 It is very important to discuss your concerns with your vet at the first signs of illness in your cat. After the initial signs, you will notice a new set of symptoms. The cat may begin vomiting. If she has eaten no food, she may just vomit a clear liquid. If she is not drinking water, she may have the dry heaves. Many pet owners think that their cat has been poisoned during the initial stages of distemper. The cat may develop severe diarrhea. In some cases, she may develop bloody stools. Dehydration is another common result of progressing distemper. When your cat is unable to eat or drink and can't keep anything in her system, dehydration sets in. Look carefully at the animal's eyes. Cats will often develop a haw in the inner corner of the eye when they are ill. This looks like a third eyelid. The animal's coat will become dull and rough. On a long-haired breed, the hair may become matted. Your cat will stop grooming as she feels weaker. There will be evidence of abdominal pain. Sometimes a cat will lick or bite at her abdomen in an effort to sooth the pain. It does not look like the grooming she does normally. Some cats develop a yellow color to the skin around their ears as they become jaundiced due to liver malfunction. A blood test will reveal fewer white blood cells than normal. This is due to the virus directly attacking and killing white blood cells. If the distemper is allowed to progress with these symptoms, the cat will suffer convulsions and eventual death. When a cat is brought in to the veterinarian for treatment, Dr. Werber states that "Unfortunately it is not a good prognosis and there is no cure." Some cats are more likely to succumb to the disease than others, "Young kittens, sick cats, and unvaccinated cats are most susceptible, and many will die." Dr. Werber advises that "treatment involves supportive care." This includes, "Intravenous fluids to help keep the cat hydrated, antibiotics to help prevent secondary infection, and often parenteral nutrition to help keep them strong to be able to fight off the virus." Your vet will administer medication to lessen vomiting as well as a treatment for diarrhea. This will bring an end to the cycle of dehydration. If the cat is already dehydrated, your vet may give her fluids. These are typically given intravenously, and your pet may need to stay overnight at the veterinary clinic for observation. The vet may also choose to administer antibiotics. This is because the cat's immune system has been compromised by the distemper and this makes it possible for secondary infections to take hold. The earliest symptoms of distemper show up about ten days after your cat has been exposed to the disease. How Do Cats Get Distemper? Exposure can come through contact with other cats, or even a run-in with an infected raccoon. Although humans and dogs cannot catch feline distemper, they can indirectly spread the disease if they do not properly wash any skin or clothing that came in contact with the sick cat. An indoor cat can get distemper as the virus can be brought into the home by other members of the household. Distemper is a serious disease. According to the American Veterinary Medical Association, up to 90 percent of cats will die from distemper if left untreated. With early intervention and proper treatment, a mature cat "that has been otherwise healthy has a better chance for beating the infection" and can recover from feline distemper. Kittens have a lesser chance of surviving this disease. Dr. Werber notes that "Interestingly, cats who survive an infection are immune to any further Panleukopenia infection in the future." If you suspect that your pet may have cat distemper symptoms, the best thing to do is take her to the vet for diagnosis as soon as possible. According to Dr. Werber, "As with most viral infections, the best treatment is prevention via vaccine. All kittens and cats should be vaccinated against this disease." 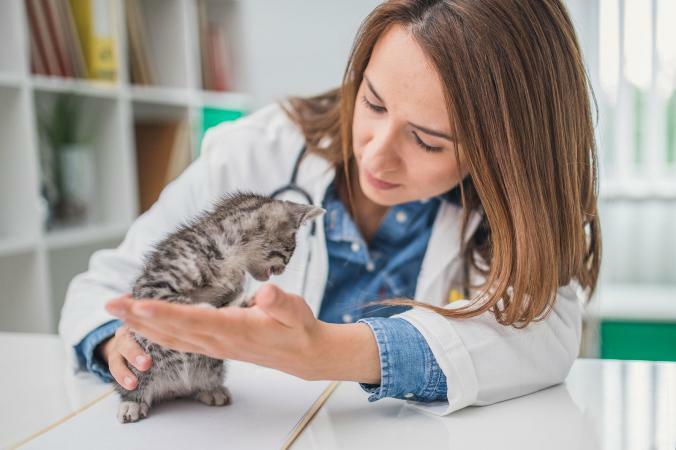 He urges cat owners to, "Check with your veterinarian about vaccine scheduling and booster frequency," to keep your cats safe from suffering from feline distemper.